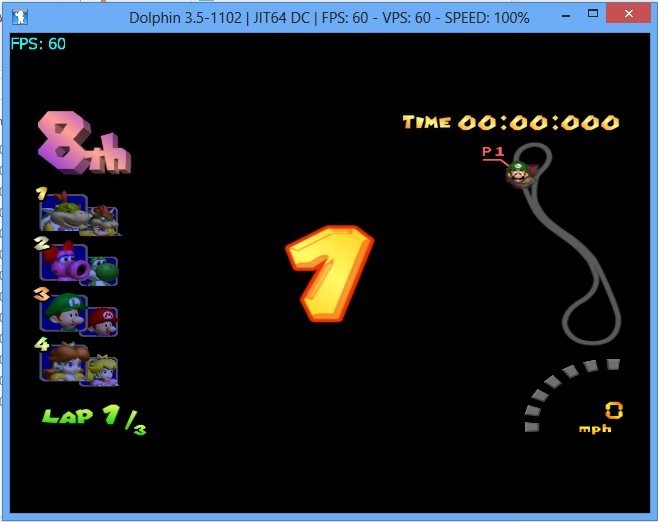 Here is two GlovePIE scripts to play Mario Kart: Double Dash!! with a WiiMote, with or without a Nunchuk. Here's another gameplay video. Actually it's a replay as I only had a cell phone to film it. But I guess it's just showing that Eyefinity/Surround Gaming looks interesting. Just noticed this on the latest builds using d3d9. Everything looks fine in the menus. When you start the race everything goes black. -1098 is fine -1099 and higher is like this regardless of ir or AA. To fix it you have to check "Skip Dest. Alpha Pass" but that also makes the game darker and lose most of its shadows. I haven't reported this as a bug since d3d9 is deprecated and anything that screws it up will probably just be considered the cost of moving forward. I thought at the very least it should be on the wiki though. Also, while I'm here, 3.5-367 nor any version after has had working HLE audio. I'm having issues with MKDD and DX9 as well, except when I get in-game, my graphics drivers crash. i don't have any music with LLE sound, what do i need to do? (04-24-2013, 11:22 AM)kirbyofthestars Wrote: i don't have any music with LLE sound, what do i need to do? With HLE it's normal. Music is broken. With LLE it works. But your CPU is too weak to use LLE properly. Stats? You mean enter your own results in "Testing"? by stats i mean your pc stats, the ones you put in bottom of your answer,anyway, i said LLE audio it doesnt sound no music at all (only the intro video, main menu and character selection screen music sounds) even with 3.5-1301, i don't want a emulator if it doesn't sound any music, it makes me feel like the game is dead, and i could be doing something else, ther version i'm using is 3.5-367 and it works good, but it sometimes freezes in mario party 5 and paper mario the thousand year door, i don't know but i remember just like 5 or 6 days ago i downloaded a revision that make the music in double dash sound and the games had an option that reduces random freezing just like in mario party 5, do you know what revision could it be? OK. You meant your "specs". Under your pseudo (top of the page) you'll find "User CP". You can modify your profile here. Well with LLE sound should work just fine. No issue here. (04-26-2013, 10:09 AM)kirbyofthestars Wrote: version i'm using is 3.5-367 and it works good, but it sometimes freezes in mario party 5 and paper mario the thousand year door, i don't know but i remember just like 5 or 6 days ago i downloaded a revision that make the music in double dash sound and the games had an option that reduces random freezing just like in mario party 5, do you know what revision could it be? okay i understand, but could you please tell any developer about my problem please?